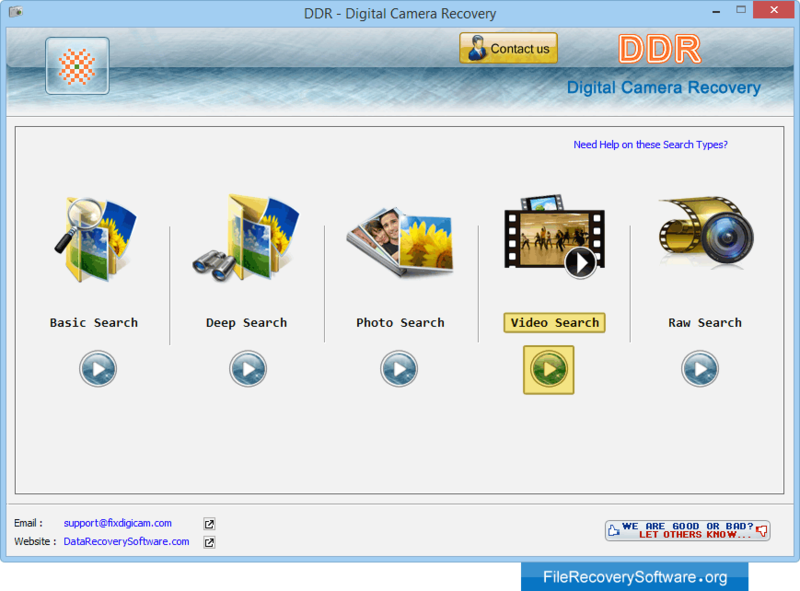 Digital camera photo recovery software is easy-to-use utility for the users who have lost their pictures, photographs, favorite music, audio video files etc from Digital camera. Digital Photo Recovery tool can help you to recover lost images from corrupted or accidentally formatted digital camera memory cards. Digital camera data recovery restores corrupted photo files, deleted music, videos etc lost due to various reasons including: Accidental picture deletion, Logical disk damage, Software or hardware virus, Improper software Installations and similar data loss situations. 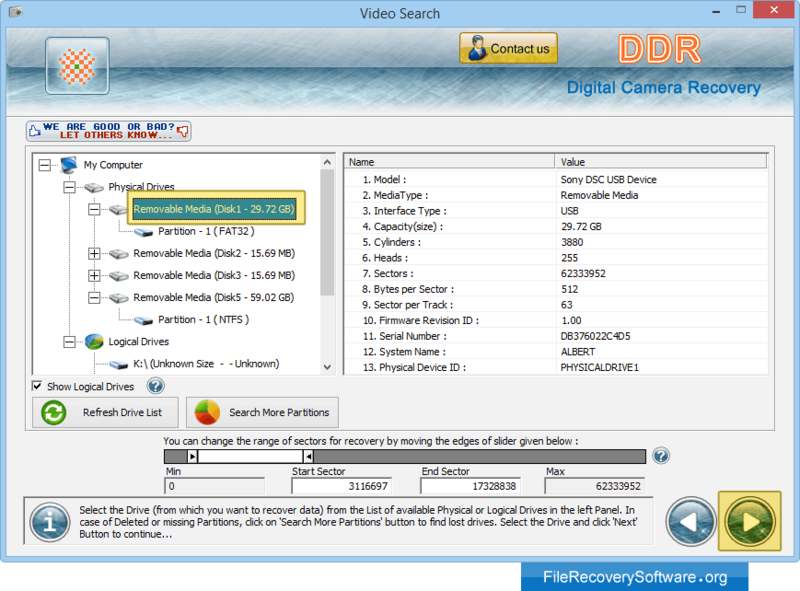 Files recovery tool restore deleted or corrupted data even when digital camera memory card is being pulled out while the camera is in running mode. Software supports Point and shoot Camera, Professional Camera, Digital SLR Camera, Novelty Camera, Compact Camera and latest digital camera models. Software restore deleted corrupted or accidentally formatted data saved in major file formats including: Pictures and images (jpg, jpeg, gif, png, tiff, rif etc), Music, Audio & Video files (avi, mp3/mp4 files, wmv, aac, mov, mpeg etc), MS Office application and documents (txt, doc, docx, html, xls, ppt, mdb, pdf etc) and other similar file formats. Utility helps to retrieve accidentally lost digital data from major branded Digital Camera or Camcorders such as Olympus, Canon, Panasonic, Sony, Samsung, Toshiba, Kodak, Fujifilm, Konica-Minolta, IBM, Hitachi and other popular digital camera brands available in market. 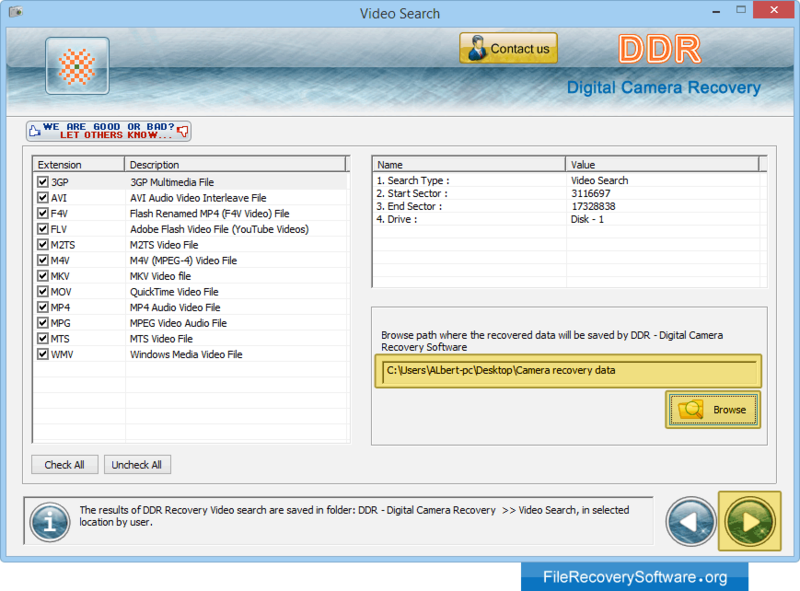 Select any Search among Basic, Deep, Photo, Video, Raw Search to recover your lost or deleted data. Select the drive or partition from which you want to restore lost data from the list of Physical or Logical Drives. 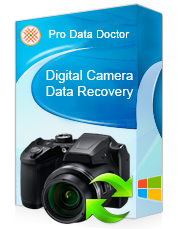 Browse path where the recovered data will be saved by DDR - Digital Camera Recovery and go to 'Next' button.